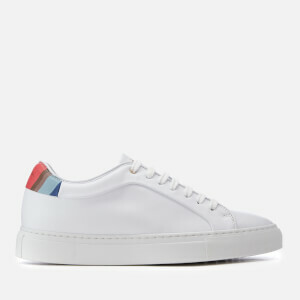 Made from smooth white leather, the low-top ‘Lapin’ trainers from Paul Smith feature glittered ‘Artist Stripe’ webbing on either side of the lace guard with metallic trims and heel caps. 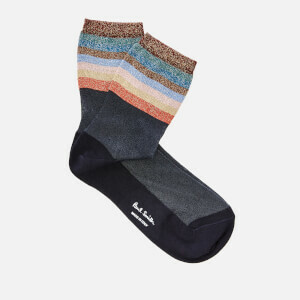 Set upon a rubber cupsole, the round-toe sneakers are fastened with white laces. 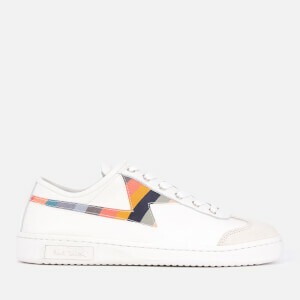 Lined in soft suede, the trainers are detailed with an embroidered logo badge on the tongue, the letters ‘P’ and ‘S’ embossed on the back heels, and a logo stamped into the outer sole.